It’s important for breastfeeding and bottle feeding that both you and baby are comfortable and relaxed so your baby stays latched on to the breast or bottle for the desired feeding time. Whether you’re breastfeeding or bottle feeding, you will spend hours sitting with your baby each day and night for many months as you nurse your baby. This is a really precious and memorable time. 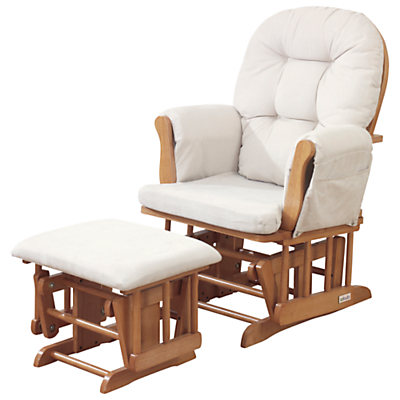 Haywood Glider Nursing Chairs provide you and baby with a comfortable, cosy and relaxing place to nurse. If you’re looking for the best nursing chair the Haywood Glider Nursing Chair will meet your expectations in luxury, comfort and style. It’s wide, plush and perfect for breastfeeding or bottle feeding. Made from solid wood it comes with a matching footstool so you can put your feet up and relax in comfort whilst nursing your baby. The Haywood Glider Nursing Chair can also be used by others to relax in and read to baby. The Haywood Glider Nursing Chair dimensions are Height 96cm x Width 69cm x Depth 71cm and the Footstool dimensions are Height 36cm x Width 49cm x Depth 41cm. If you’re like most parents, time is something you simply don’t have enough of. And feeding your family with the best, most nutritious foods will be a priority for their health and wellbeing. Instead of spending your time shopping at the supermarket with babies and toddlers in tow, you can quickly order your weekly Fruit, Veg, Dairy and Meat online from Riverford and have it delivered to your door. Quickly choose the right sized organic veg box for your family with the new Riverford Veg Box Chooser. Just select your answers to these easy questions ‘how many people you are feeding’ and ‘how many times a week you cook’ and the right Veg Box will be conveniently chosen for you. 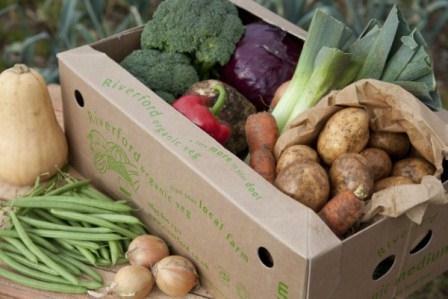 You can include delicious, fresh and organic Fruit and organic Meat in your Riverford order. There are also Dairy Products and everything else you need for healthy and tasty meals in the Riverford Shop. Find out how much we enjoyed our Riverford Veg Box. Are You A Baby Whisperer? I recommend you read the insightful book The Baby Whisperer Solves All Your Problems by Tracy Hogg before you have your baby and refer back to it when necessary once you’ve had your baby. There’s so much useful information in this book that I use it when I need guidance with a particular issue, or just to check if I’m doing things right. 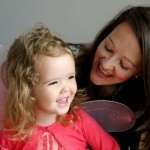 It focuses on sleep, feeding, the behaviour of your baby and everything in between. Even my husband has turned to this book for advice several times, now that’s saying something! I diligently made a list of ‘how to parent’ books I wanted to read before I had my baby. But I’d forgotten, things never go according to plan! In the month before our baby was due we decided we had to have our bathroom renovated. Time slipped through my fingers as I sourced tiles, tap fittings and a new showerhead. No problem I thought, I’ll have plenty of time when my baby’s born and she’s sleeping peacefully in her Moses Basket whilst I relax on the sofa next to her. Ha! In the early days my baby didn’t like to sleep too much in the hours of daylight. And when she did sleep, it was mandatory she was swaddled and held (thank you Moby Wrap for helping with this). So in those rare moments of slumber during the day, they certainly didn’t allow me much time to hold a book!